The user searches for ‘ASOS’. 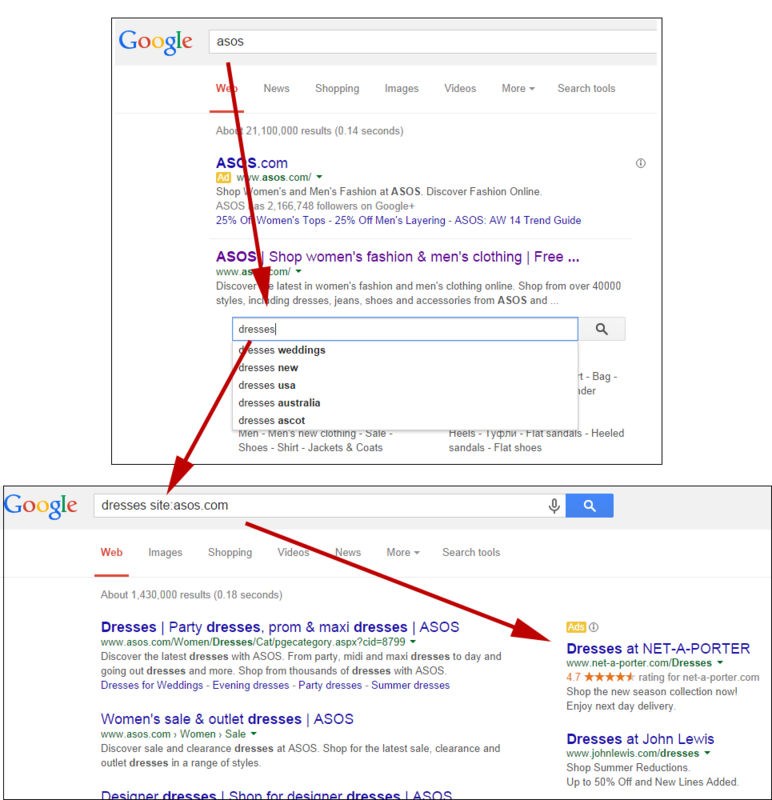 Google show the search results page for ASOS. 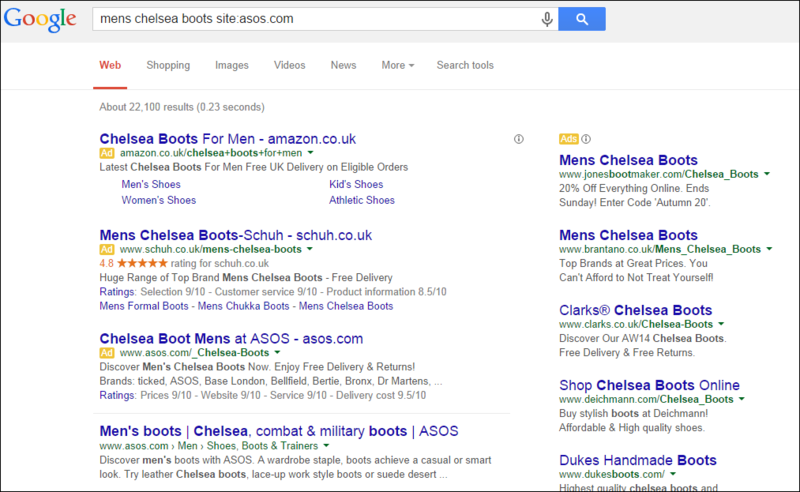 Google takes the user to a search results page where the organic results are all from ASOS’ site, but the ads are all from competitors. From Google’s point of view, a search term where they could expect a very small amount of ad spend in the past (brand search cost per click direct to the brand site is usually very low) has suddenly turned into a big revenue opportunity. They of course have the ability to ‘autocomplete’ that search box with any terms they choose, and to populate ads in any way they choose on the page afterward. From the main brand’s point of view (ASOS in this case), suddenly their brand search – a page where they’ll have spent lots of time, effort, and money to try and ensure they fully ‘own’ has the potential to drive customers to competitors. From the secondary brands’ position (in this case Net-a-Porter & John Lewis), this is an opportunity to ‘steal’ a customer who had been searching specifically for another brand. And below is perhaps a more controversial example. 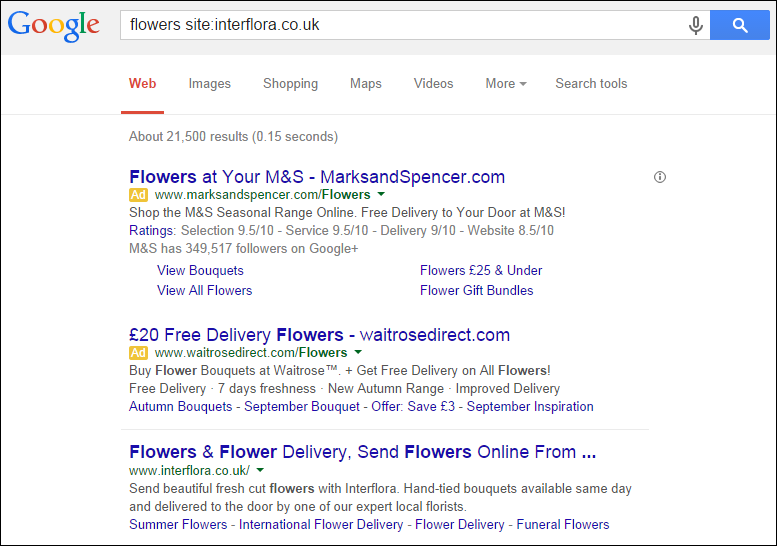 Interflora fought a long battle with Marks & Spencer, based around Google Adwords, and their perception that M&S were unfairly gaining customers off the back of their brand. I triggered the below by searching Google for ‘Interflora’, then searching for ‘flowers’ in the sitelinks search box (the exact wording on the sitelinks search box is ‘Results from interflora.co.uk’). I suspect Interflora would not be delighted by this. Multiply this across the tens of thousands of brands where Google is enabling these Sitelinks Search Boxes, and – assuming users take advantage of them – is likely to be a big revenue driver for Google, a big opportunity for some brands to target their competitors, and a cost for others to protect their own brands. It will be interesting to see the impacts of this, especially tied with Google recently removing the ability to exactly target particular phrases. Do leave any thoughts below, or share this with others if you think they would find it interesting or useful. I updated this post to add extra examples from Mark Pinkerton (chelsea boots), Peter Wilson (how to protect), and Geoff Losse (interflora). I don’t have any real concerns about the search box as long as we have the option within Google Webmaster Tools to be able to switch this off if it is negatively affecting the performance of the site. Some great observations there. Historically, we’ve typically seen less than 1%of clicks from direct brand competitor searches, but obviously if they are running strong offers and messaging it could easily be higher than this. And the fact it’s on an internal brand search is quite harsh. It’s G though, and any and every ad impression that they can get, they will push to get. We’ll always recommend companies use their own internal search to populate these results though, for more accurate results in general really. Great insight here! I’m not adept at PPC but it seems pretty shady Google would serve competitor ads on these kinds of queries. It’s going directly against what the user wants and creates a poor search experience which Google used to fight against. It’s not just a misstep for users, it will be a stumbling block for small advertisers, which can increase the cost per click. Great insight! While this is just the start, I can see Google updating AdWords to prepare for this alternative bidding method. Plus, there’s always the “ungentlemanly thing” where brands can bid on their competitor’s terms, perhaps even showing up above the organic site:domain.com results. It’s definitely obvious now that Google wants more money, but what a covert way to get it! One thing to keep in mind is that you can bring this site-search traffic to your site too — by using the markup from https://developers.google.com/webmasters/richsnippets/sitelinkssearch . That way, users will be able to use your internal search pages, with whatever design you choose. I’ve seen plugins that make adding this markup as easy as selecting a checkbox :). Another despicable and inexcusable way for Google to monetise brand traffic for it’s own financial gain, similar to the way it shows it’s own car insurance comparison engine for terms like ‘moneysupermarket’. Surely the big problem here is that Google is not putting either consumers or its advertising clients first. The consumer journey is more confused and the Adwords customer is less likely to get an ROI. I’ve seen lots of clients where their brands terms are there only viable PPC. And now google is squeezing this. Google need to understand that if they are seen to unfairly exploit their customer base that they are far more likely to be susceptible to major market fluctuations at some point. Has anyone installed the search engine markup (i.e. 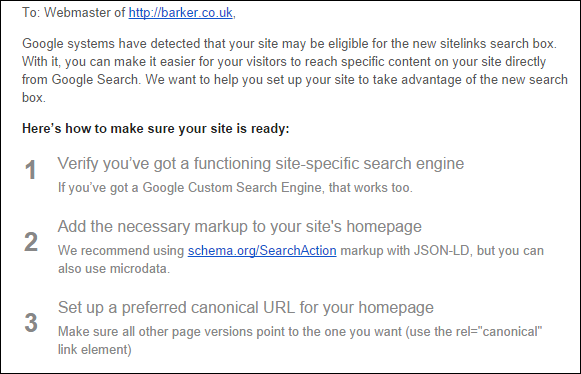 to take people straight to your own site) yet, or got an example of a site that has? What Would Happen if you Flipped the Scotland #indyref Question? Is the Cookie Law Being Enforced in the UK?